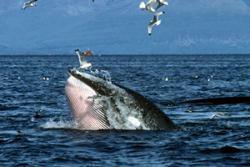 Minke whale lunging through a large shoal of sprat in the Inner Hebrides. : Photo: Peter EvansOf the 29 cetacean species recorded around Britain, 15 are regular inhabitants. But we know very little about all but the most common species. Some species such as fin and humpback whales, among the principal targets of the early 20th century whaling industry, show signs of recovery, with a marked increase in sightings. sandeel and sprat for which the whales competed. However, since the mid-1990s, the abundance of minke whales as assessed by large-scale surveys (SCANS in July 1994 and SCANS II in July 2005) has shown no significant change. 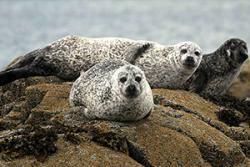 Harbour seals have been declining in several areas of Britain. : Photo: Peter EvansWe know much more about seal populations than whales, thanks mainly to the monitoring efforts of the Sea Mammal Research Unit at the University of St Andrews. With an estimated population size of around 112,000, the UK accounts for 38% of the world’s Atlantic grey seals, which appear to be thriving. The majority (88%) breed in Scotland where, since the 1990s, they have been growing in numbers, particularly around Orkney and parts of the North Sea. Only in the Hebrides have pup birth rates remained fairly static.